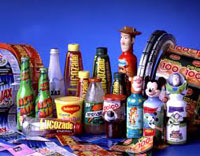 Flexible film and shrink sleeve production have revolutionized the label and packaging world. Able to produce printed roll-fed film, shrinks sleeves, and flexible heat sealed or cold sealed gusseted or non-gusseted pouches, this expertise allows for efficient, quality packaging of an endless array of products. Produced under Good Manufacturing Practices and certified by the American Sanitation Institute this packaging is applicable for both food contact and non-food contact packaging and is cost effective for small or large quantities.